Merry Christmas to everyone from our family to yours. Thank you for all the wonderful Christmas wishes from around the world. Today is present opening and sit-round-and-enjoy-the-day day.Â We will have family and friends stopping over so come on by. We will have the extended family (brothers and cousins)Â over Christmas Eve for initial gift sharing. This will be after the immediate family enjoys Christmas Eve dinner (a Polish Wagilia) at sundown. Then, Christmas morning is the big present opening time and, after that, we’ll be having an open house for family and friends to stop by. You should stop by too. Merry Christmas all. The tree is up and illuminated. We are putting the ornaments on this evening (Sunday) so it will soon be more than green but also enhanced with ornaments that are new and old.Â Merry Christmas everyone! Happy Thanksgiving to everyone in the USA and remember to give thanks for all you have to the rest of the world. We are having the family over for the traditional meal and will give thanks for home, hearth and family. Enjoy the day and enjoy your blessings. To enjoy the season, I added some Halloween lights in the livingroom that are connected to the dining room accent lights and, for another year, the neon bat is in the kitchen with its own control. Happy Halloween. Haven’t written much. The house made it through the summer and the kids are off at school. The holiday season is coming up — Halloween first. Boo! It’s the Forth of July and, here in the United States, we celebrate Independence day. We’re having a big party with friends and family. Hope you all have a great day and remember your freedoms and blessings wherever you are. The boys are home from college. They were little when LivingroomCam started and now they are about to move out. You should occasionally see gaggles of teenagers and young adults as well as the parents hanging around. Hope you all have a great summer. Today we’re having the family over for Easter. At least as much of the family we can get — some are sick, some are with other parts of the family and some are just too far away. Happy Easter all! Happy New Year everyone. The Christmas decorations are down and the boys are returning to college. Back to the same ol’ routine. 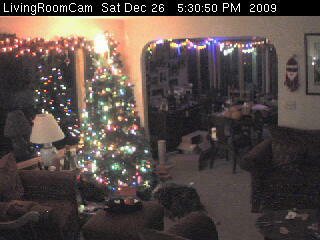 A camera in our living room and kitchen, a cable connection, a little software and what do you get? A family's home on the Web! Welcome to our living room. We are usually around in the evening (Pacific Standard Time). Send us email ("misterblue-mb at misterblue dott com") and enjoy relaxing at our house. Our house has been on the internet over 14 years. We started with an ISDN connection, went to DSL and now have a cable connection. These days anyone one can do this but long ago I had to write my own video capture software and know the phone number of the local phone company tech. A pictorial description of how the hardware is put together these days is on the How It Is Done page. Many years ago we started leaving a light on at night so the people on the other side of the planet have something to look at besides black. Now you can control some lights so flash us and let us know you are there. I also collect one image an hour for the last 24 hours .